Saphaipae is a new eight-storey Hostel in the heart of the city located on Surasak and Sathorn. From Saphaipae, sky train and Water taxi are within the reach (5-10 mins walk). These two main transportations allow you to easily commute to many tourist attractions including Cultural area (Grand palace, Wat Pho, Golden Mount), shopping district (MBK, Pratunam, Pantip), Night life (Patpong, Chiana town, Asiatique, Asok). Our hostel is nearby supermarket, 7 eleven, police station, banks, post office, morning market and etc. It is very convenient and safe. Pay less but Get More at â€˜Saphaipae. Our hostel is design to be your quiet and chill home base. 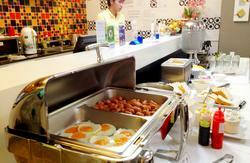 You can rest, eat, and travel within your budget with our exclusive free breakfast buffet worth 99 THB. Our facilities equipped with top standard of all amenities and commodities to best serve your needs. We have Laundry rooms, movie room, on site restaurant to (Pad Thai, Tom Yum Goong), cafÃ© (fresh brewed coffee), a travel agent and friendly 24 hours reception at your service. Our Saphaipaeâ€™ beds are unlike any other hostelsâ€™ beds. Our soft beds are 7-8 inch thick with top of the line duvet in order to make sure that you have relaxing and peaceful rest. Each bed come with fresh clean linens and equipped with personal power socket, reading lamp and Wi-Fi. We offer a variety of room types. We have a standard mixed dormitory room with 8-10 beds. Deluxe dormitory 4- 6 beds ideally included free towel rental. For ladies, we also have private lady dormitory with separate shared bathroom from other. Private room ensuite is also available for your best comfort. In Saphaipae we include breakfast buffet for roomtype with abf, personal lockers, lock rental, towels rental, free wifi throughout the building, free access to our many computers, free movies rental and books, free local map and Bangkok map. Staying at â€˜Saphaipaeâ€™, you are sure to get more !! 5 minute walk from Sursak BTS Station! From Suvarnabhumi Airport, take Airport Rail Link (city line) to Phaya Thai BTS Station at the end of the Rail Link line. Transfer to BTS Sky Train at Phaya Thai BTS Station to Siam BTS Station. Then, interchange at Siam BTS Station to Surasak BTS Station. Take Exit No.1, turn around and turn right onto Surasak Road. Walk down Surasak Road to a small intersection. There, Saphaipae is located on your right hand-side at the intersection. We are here to welcome you; 24/7, no curfew.